At WIJPS, our children are our most treasured possessions and we strive to ensure that their time here is both happy and productive. A great deal of time and effort is spent in making our school a really special place to learn, work and play. The warm and caring environment gives our pupils a sense of belonging and the motivation to work to the best of their ability. We have high expectations of all our children, providing each one with opportunities to enjoy success and achievement. All members of our school community work to ensure that the school is a positive, challenging and stimulating place to learn that encourages self-respect, respect for others and for the wider community. 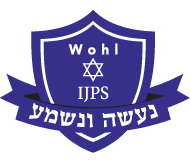 Our school promotes a positive commitment to modern Orthodox Judaism and a proud sense of identity with Israel and we provide an excellent Jewish education that is full of challenge, interest and fun. Our increasing involvement with the wider community is very important to us and we ensure that we endeavour to meet the needs of our children, their families and all those within our partnership. We are now in our state-of-the-art building on the Kantor King Solomon High School Campus. This new building will help us to continue to fulfil our aim of providing the very best education and facilities for all of our pupils.